No, it isn’t DNA Sunday here at The Legal Genealogist. Instead, it’s Christmas in August. 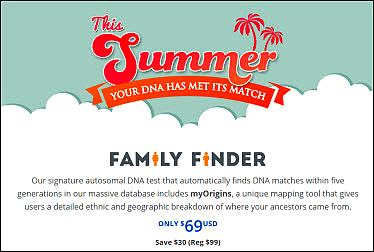 Because Family Tree DNA has just announced its summer sale… and it’s a doozy. Some of them the combinations include the Full Mitochondrial Sequence — and mitochondrial DNA (or mtDNA for short) is the kind that we all have but that’s passed down from a mother to all of her children, and then passed down to the next generation only by the daughters. So it tells us about our ancestry in our mother’s mother’s mother’s line.3 And they can be done either by men or women. Y37 + Family Finder: usual price $268, sale price $238. Y67 + Family Finder: usual price $367, sale price $337. For the ladies: FMS + Family Finder: usual price $298, sale price $268. For the guys: Comprehensive Genome (FF+Y67+FMS): usual price $566, sale price $538. All of those are good. Just one word of warning: the bundled tests have to be used on one tester. Canceling part of the bundle means the price for what’s left goes back up to the full price. But here’s the best part: if all you want is the Family Finder test, there’s a standalone price for that test, and by itself it’s a huge draw right now — the usual $99 test can be had for $69, plus shipping, during this summer sale. The Family Finder test at Family Tree DNA has some unique advantages in the DNA testing world. A brand-new feature is the ability to separate matches into the paternal and maternal sides solely on the basis of the DNA results. Other testing companies won’t do this without having a parent tested in the database — an insurmountable hurdle for those of us whose parents have passed on. Family Tree DNA, however, will divide the matches based on siblings, cousins, aunts and uncles and more. This new matching system alone makes it well worth being in the Family Tree DNA system, even if you’ve already tested elsewhere. “A brand-new feature is the ability to separate matches into the paternal and maternal sides solely on the basis of the DNA results. ” How do you accomplish this? I have been trying for weeks to figure it out and there are NO instructions and nothing seems to work. You do it through your family tree, which you can create manually or by uploading a GEDCOM file. Then you need to link the other family members who’ve tested. Check out Roberta Estes’ blog post, Family Tree DNA Introduces Phased Family Finder Matches. Thank you, I found as I added folks to my tree that had tested FTDNA populated those areas, with lots of folks. QUESTION-I have already had the autosomal test at Family Tree as well as the mtDNA–did them a few years ago. DO I need to take the autosomal test AGAIN in order to have them divide my matches by paternal and maternal sides??? OR can I send them in a small fee to have my autosomal DNA divided into maternal and paternal matches? I have LOTS of mysteries so it would be nice to know if which side my matches relate to. Thanks-PS: Love your column. Nope, you only have to create or upload a family tree and then link it to relatives of third cousin or closer. It’s those links to those cousins in the tree system that will force the maternal-paternal division.